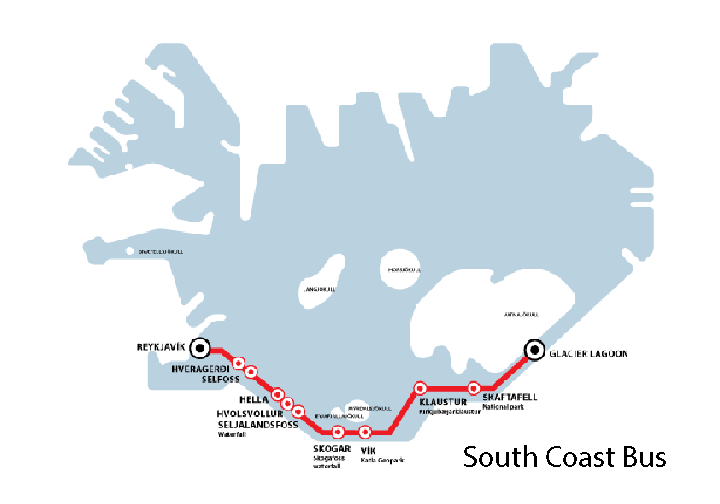 When travelling along the South coast from Reykjavík, you start by hopping on the South Coast bus from Reykjavík. Southern Iceland is generally considered to be the area from Reykjavík to The Glacier lagoon. This area has a lot to offer with its green country side, volcanoes, glaciers and waterfalls. 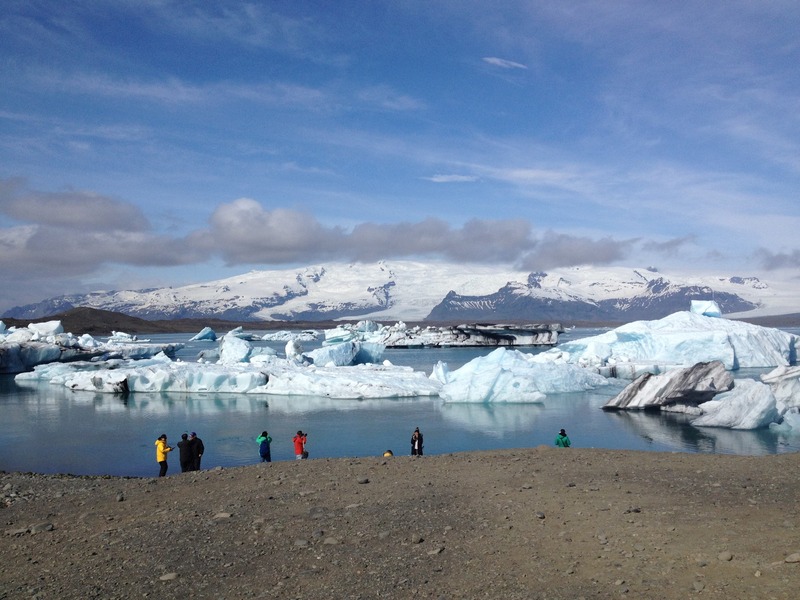 On the way, we drive through the beautiful country side, stop at several small villages and other sites such as waterfalls and of course the breathtaking Glacier lagoon called Jökulsárlón. You can hop off at any bus stop and take all the time you need to explore as long as you stay with in the operation time frame. Hveragerði is a town located 45 km east of Reykjavík with about 2.500 residents. This town is known for its many greenhouses and is often called the Flowertown. The greenhouses are heated by hot water from volcanic hot springs and in Hveragerði you will find the horticultural department of the Agricultural University and located in the town center there is a Geothermal Park. In an active geothermal area, you can always expect some earthquakes. Hveragerði has an earthquake exhibition with an earthquake simulator where you can feel the impact of a quake, +6 Richter, that hit the town in 2008. On the hills above the town, there is a marked hiking trail where you can hike through the geothermal area with hot springs all around you and bathe in a warm river. You can also explore the area on a horse riding tour. In Hveragerði you will find a swimming pool, camping place, grocery stores, several restaurants, hotels and guesthouses. We can surey reccomend an overnights stay in Hveragerði or more. In a ten minutes’ driving distance from Hveragerði is Selfoss, the largest town in South Iceland, with a population of around 7000 people. Selfoss is a thriving town with one of the largest colleges in the country and in Selfoss the MS Iceland Dairies produces the famous Icelandic yogurt called Skyr. This is a festive town and in August, the town holds a grand festival called “Summer in Selfoss”. Residents decorate their gardens, and a market, with homemade goods and performances by local musicians, is held in the town centre. In the evening, the revelry continues with a bonfire and fireworks. In Selfoss you will find various options of accommodation, a camping place along with a swimming pool. Many shops, restaurants and cafés are situated in the town centre. In Selfoss you can visit the Bobby Fischer center, which houses memorabilia of the world chess champion Robert James Fischer. Excellent hiking spot can be found in the area e.g. in Hellisskógur a short trail that takes you alongside Ölfusá river. On the far side bank of that same river you can also find a nine-hole golf course. Hella is a village within 30 minutes driving distance from Selfoss. Hella derives its name from caves (Hellir in Icelandic) near the centre of the village were Irish monks supposedly lived in the times of first settlement. Hella offers services for tourists and is in a way a tourist hub for the highlands and the surrounding country side. The volcano Hekla is nearby with many hiking options and bus connections to popular tourist attractions such as Landmannalaugar and Þórsmörk. All types of accommodation and restaurants are available along with a swimming pool, grocery shop, bakery and a camping place. Hvolsvöllur is a small village with about 900 inhabitants. The village nestles beneath the infamous volcano Eyjafjallajökull that erupted in 2010 and caused evacuations in the surrounding area. This eruption put a large section of the world to a standstill and delayed flights all over the world. The area is the scene of one of the most famous sagas of Iceland, By the main road, you will find the Saga Centre that is dedicated to Njálssaga, and other Icelandic sagas. Here you can experience the dramatic and fascinating story of the Viking age with all its romance, conflict, love, and death. From Hvolsvöllur you can visit the Westman Islands, volcanic islands where it last erupted in 1973. Take bus 52 from N1 gas station (Schedule is posted to the right of the building) to Landeyjahöfn and book the ferry Herjólfur across. Skógar has few inhabitants, but it´s the home of the Skógafoss waterfall and a historical museum. The bus stops for 30 minutes and we reccomend that you take the steps up beside the waterfall for a fantastic view. Skógar is also the starting or end point of the Fimmvörðuháls hiking trail that takes you over a mountain pass to Þórsmörk. Nearby there is Sólheimajökull glacier where you can book a Glacier walk tour with the specialists at Arcanum glacier guides. In Skógar you will find many aminities like hotel, hostel and a camping place. An ideal place to camp for one or more nights. 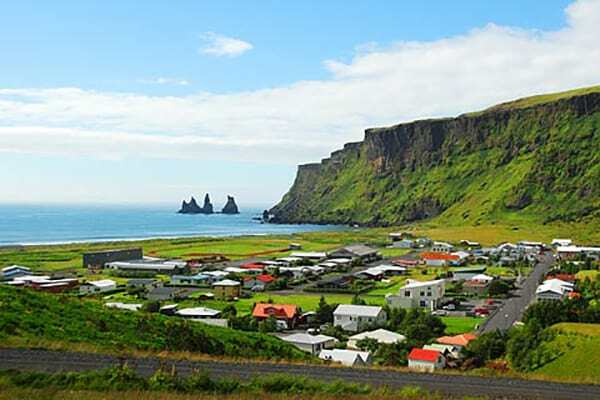 The town of Vík is located in a beautiful setting by the sea with its signature black sand beaches Reynisfjara, ocean cave and seaside cliffs Reynisdrangar. It is ideal to hop off the bus in Vik and spend a day or two to explore the area. Vík lies directly south of the Mýrdalsjökull glacier, which itself is on top of the Katla volcano. Katla is an active volcano that has not erupted since 1918, and this longer than typical dormant period has led to speculation that an eruption may occur soon. 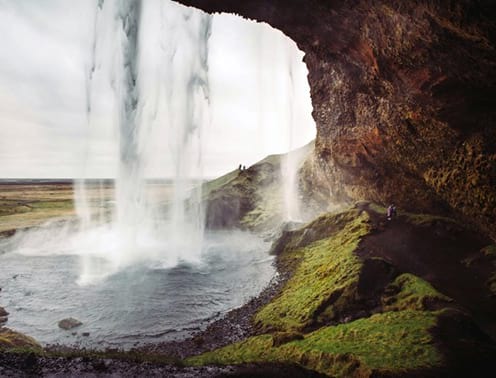 In Vík you will find the Katla geopark that covers about 9% of Iceland, and follows the borders of three municipalities and includes three volcanic systems: Eyjafjallajökull, Katla, and Grímsvötn. In Vík True Adventure offers tandem paragliding tours with instructors to experience the area from a new and exciting perspective. A tandem flight is an introductory paragliding flight and as a passenger, you need no prior training. Vík is a thriving tourist village with restaurants, hotels, guesthouses and a camping ground. Vík is a end station when traveling from east to west (e.g. the Glacier lagoon) towards Reykjavík and the next bus to Reykjavík is at 13:00 the next day. If your ate going further east on the same day to Kirkjubæjarklaustur please note that you must change bus at Vík. The village Kirkubæjarklaustur, often abbreviated to “Klaustur”, is a service centre for the farms in the region as well as for tourists. From Klaustur the roads radiate in many directions, the Laki road, leads into the highlands and the Fjallabak roads (north and south) lead from the Ring Road into the interior via Skaftártunga. The entire region is bursting with tales connected with events that occurred when Klaustur was the site of a convent. Before the Norse settlement of Iceland, Irish hermits, called Papar in Icelandic, are believed to have lived at Kirkjubær. Tales say that it has always been inhabited by Christians and pagans, as most Icelanders were, not welcome there. In 1186, a Benedictine convent was founded at Kirkjubær. The convent was active until 1550 and many local place names and folk tales still reflect the presence of the nuns and ecclesiastical history. In Klaustur you find all types of accommodations, a Café, camping place, swimming pool and a grocery store. Plenty of hiking trails to explore. We stop only briefly at Klaustur so if you are plannig to explore we reccommend an overnight stay. Skaftafell is a national park located at the foot of Vatnajökull glacier. Here is ideal to hop off the bus and spend a day or two hiking around the beautiful landscapes. Within the park lies half of the largest ice cap in Europe, and is surrounded by glaciers on three sides. It offers a view of the volcano Laki and the tallest mountain in Iceland, Hvannadalshnjúkur, 2.110 m. Hikers will find plenty of hiking routes within the national park with hiking path suitable for every traveler. Short and easy routes are to be found near Skaftafell glacier e.g. 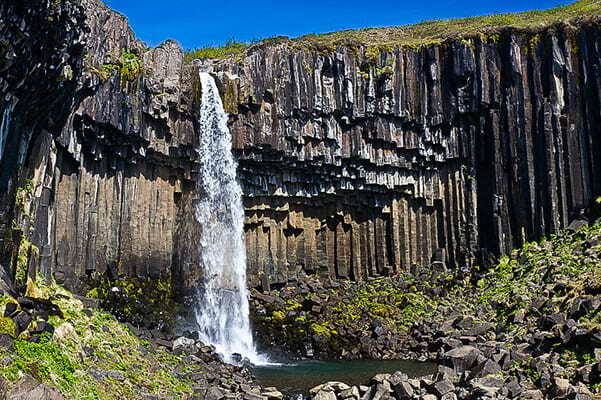 to Svartifoss waterfall (Black fall), a breath-taking 12 meters high waterfall, with black columnar basalt formations which frames the waterfall. 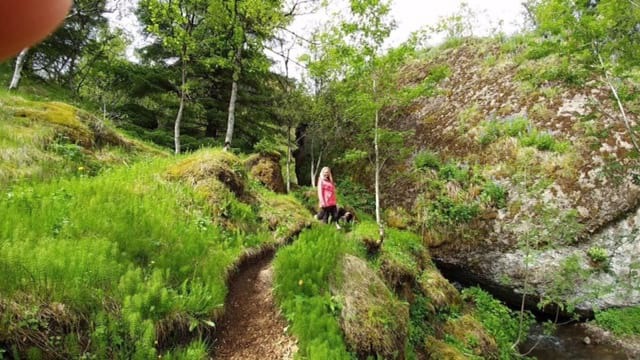 Longer hiking trails lead to Morsardalur and Kristinartindar and Skaftafell‘s location next to Öræfajökull makes it an excellent starting point for a hike up Hvannadalshnukur. Glacier guides offer hiking guidance from Skaftafell. In Skaftafell you will find a camping site with amenities such as a shower, restaurant, outdoor grills and a washing machine. Please note that there are no accommodation nor camping facilities at the Glacier lagoon so you must hop on the bus from Glacier lagoon at 17:45 the same day. So there is a lot you can explore at Skaftafell so we definetly reccomend an overnight stay or even more. The Glacier lagoon is considered as one of the natural wonders of Iceland. The picturesque lagoon is open to the sea and contains a mixture of salt and freshwater, giving the water a unique blue-green color with floating icebergs. It is no wonder that it has been the setting for Hollywood blockbusters like A View to a Kill, Die Another Day, Lara Croft: Tomb Raider and Batman Begins. Option to book a 30-40-minute boat ride among the floating icebergs that have broken off the retreating glacier. If you decide to buy a boat tour, please be aware that the bus only stops at the lagoon for a short time (see timetalble) . Please note that there are no accommodations nor camping facilities by the Glacier lagoon so you must take the bus back to Skaftafell, Kirkjubæjarklaustur or Vík the same day and overnight there.